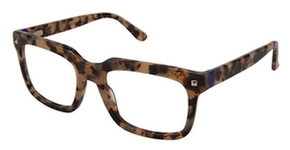 GX by Gwen Stefani eyeglasses were created by Gwen Stefani's internal style sense, as the driving force behind the eyewear brand featuring a mix of vintage masculine and feminine eyeglasses frame shapes and a playful interplay of Hollywood glamour and street influences. "I like the contrast and the clash and the resulting balance you get from mixing soft and hard elements in eyeglasses," she says. "I go back to that inspiration over and over again." Gwen's rapid rise to fame happened as the lead singer of the rock band No Doubt. The band was a worldwide success, and she then went on to record two solo albums that went platinum. Her launch of L.A.M.B. eyewear represents another creative outlet for the talented star - and a lasting business. - "I'm not always going to be running around doing cartwheels on stage for the rest of my life ... L.A.M.B. is something that can be lasting and something I can continue to do in the future with a family."